Rest in Peace Brothers you will not be forgotten. I have been a part of the fabric that has held the line between your safety and your victimization. I have given my life so that others may live in peace. I have lived my life as a dedicated member of the greatest profession. There is no greater honor. MAY YOU REST IN PEACE AND MAY YOUR FAMILY FIND COMFORT IN THE GOOD YOU HAVE DONE HERE ON EARTH. Thank you for being there for us despite the pain, fear, frustration, and risk of service. I don't really understand price of service, I just know that I could not live my life without the sacrifices of officers. Thank you. I pray that God holds your family. God bless you my brother. Rest in Peace. Peace to you and your fellow officer and buddy. God Bless You, Your Family, & Friends. Thank you for your unselfish service. My heart is sick for the families of the fallen members and all who serve in the NYPD. We suffered our own senseless losses earlier this year. My heartfelt condolences. RIP Officer Liu. Peace go with you and for your family. Rest in peace brother.....we have the watch now. Never having met you, I cant help but feel pain. RIP to you Wenjian Liu, your service to your community and the citizens will never be forgot. RIP--go rest high, on that mountain. Sending all my love and prayers to your family--from Clearwater Florida, WE SALUTE YOU! Officer Liu thank you for your service. You will be missed by your fellow officers, but not forgotten. My thoughts and prayers go out to your family. 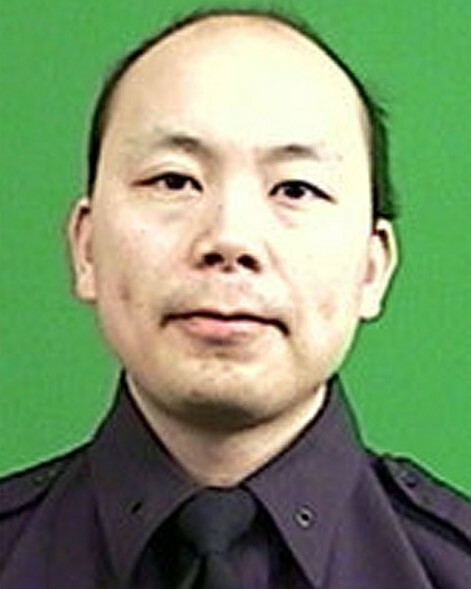 Rest in Peace PO Wenjin Liu. Condolences to the families; the entire NYCPD and the City of NY. “The bravest are surely those who have the clearest vision of what is before them, glory and danger alike, and yet notwithstanding, go out to meet it.” Thucydides These officers like all others throughout the country epitomize this. Rest in Peace Officer Liu. Our thoughts and prayers are with you, your family and the NYPD. You will always be remembered as a hero. Thank you for your service, and let all others remember you for the good you did. A portion of a letter written by President Abraham Lincoln, printed in the Boston Evening Transcript on November 25, 1864. “I feel how weak and fruitless must be any word of mine which should attempt to beguile you from the grief of a loss so overwhelming. But I cannot refrain from tendering you the consolation that may be found in the thanks of the Republic (they) died to save. I pray that our Heavenly Father may assuage the anguish of your bereavement, and leave you only the cherished memory of the loved and lost, and the solemn pride that must be yours to have laid so costly a sacrifice upon the altar of freedom. Rest in peace my brothers, May God be with you and your families. You will never be forgotten. Prayers for the families and the NYPD. All Gave Some, Some Gave All Some stood through for the red, white and blue And some had to fall And if you ever think of me Think of all your liberties and recall I Gave All....Rest in Peace! Rest in Peace Officer Liu. You, your family, friends, and the NYPD are in my thoughts and prayers.